This spine-tingling sequel to Withering-by-Sea sees Stella sent away to the moldering old family estate, where she discovers two odd cousins—and a mystery. Eleven-year-old Stella Montgomery has always wondered about her family. What happened to her mother? And could she have a long-lost sister somewhere? 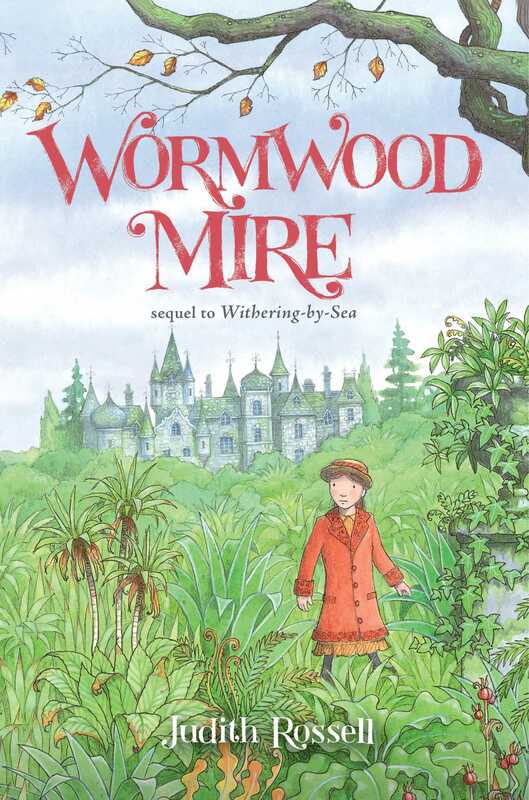 Stella’s awful Aunts refuse to tell her anything, and now they have sent her Stella away to the old family home at Wormwood Mire, where she must live with two strange cousins and their governess. Stella Montgomery gazed out of the window of the train as it trundled slowly through the bleak countryside. It had been drizzling all day, and now evening was approaching. The empty compartment was cold and shadowy and dispiriting. In the lamp overhead, dregs of yellowish oil and several dead moths sloshed to and fro. Stella’s new boots pinched her feet, and her new dress was stiff and uncomfortable. Pulling her coat more tightly around herself and burrowing her hands into the pockets, she stared out at the wintry trees. She had never felt more lonely. She wished she had a friend for company. Even Ada, Aunt Deliverance’s bad-tempered maid, would have been better than nobody. But after a grudging currant bun and a cup of tea at the station, Ada had pushed Stella into the second-class compartment, said, “Behave yourself, miss,” and given her a silver shilling and a grumpy pat on the head. Then she had stalked away down the platform without looking back, and that was that. Or you will surely come to shame. In the next story, Beatrice stole a preserved damson, tried to wash the incriminating stains from her pinafore, and later died of a fever, brought on by the damp fabric. Cornelius and Drusilla disobeyed their parents and were trampled by a flock of angry sheep. Or you will soon be dead and cold. It was not a cheerful book, and the pictures were vivid and rather unpleasant. Stella had read it all the way through three times. She sighed and tried to think of something encouraging, but she was too miserable and forlorn. It had been a very long day. She had changed trains twice. The first change had occurred at an enormous, smoke-filled station, where she had been almost overwhelmed by the noise. A helpful porter had rushed her through the crowd at a desperate pace and bundled her into her train just as it was leaving. Despite this, she had somehow missed her second connection and had waited for several hours on a lonely country platform, with only the cold rain, a row of empty milk cans, and a station cat for company. This train was the slowest so far. It wound its way through the woods and fields and tiny huddled villages, sometimes stopping at stations where nobody seemed to get on or off, and sometimes stopping between stations for no reason at all. The railway bun had been many hours ago, but Stella was too nervous to feel hungry. She blinked back her tears and swallowed. She did not want to arrive with her eyes red from crying. And if she started to cry, she might not be able to stop. The Aunts had been furious. Stella had never seen them so angry. She had been in disgrace many, many times before. Even when she tried hard to be good, the Aunts were disapproving. But this time had been far worse. She had been missing for two nights. The police had been searching for her. And when she had returned, she had been dressed as a boy and covered with mud. She had tried to explain how it had happened, but somehow it only made things worse. The Aunts refused to listen. Stella could almost hear Aunt Deliverance’s bellowing voice, keeping time with the rattling train. “Disgraceful,” Aunt Temperance had added, her wandering eye circling in an agitated manner. “Yes, indeed,” Aunt Condolence had agreed, her Particular Patent Corset twanging and creaking. All three Aunts glared at Stella, and she looked at her muddy boots and tried not to cry. “Train the vine as you would have it grow,” said Aunt Temperance. “Spare the rod, spoil the child,” said Aunt Condolence. “A firm hand is required. Discipline. Perhaps a strict governess. Or school.” Aunt Deliverance closed her mouth with a snap. Stella’s heart sank. A strict governess sounded terrifying. And school might be even worse. She had seen the girls of Miss Mallard’s Academy for Young Ladies silently walking two by two along the Front at Withering-by-Sea. They seemed miserable, and their mistresses looked grim and bad-tempered. Any school chosen by the Aunts would be particularly dreadful. For weeks she had been in disgrace. The weather had been terrible. Icy winds, rain, and storms had prevented the Aunts from taking their daily promenade along the Front. Instead they had stayed inside and glared at Stella as she walked around and around the parlor with a book balanced on her head (to improve her deportment), or sewed her sampler, or practiced the pianoforte. Every day, she had cold porridge for breakfast, cold meat and potatoes for luncheon, and bread and water for supper. Every day, she felt a bit more miserable. At night she had leaned on the windowsill of her tiny bedroom on the third floor of the Hotel Majestic and looked out at the sea. Down along the pier, the gaslights twinkled in the rain. On still nights, she could hear the cheerful, tinkling music from the merry-go-round, and sometimes she imagined she could almost hear the band playing in the theater and the audience applauding. Her new friends were down there. Ben and Gert and Mr. Capelli. But they might as well be a hundred miles away. Her Aunts had forbidden Stella from seeing them again, and perhaps she never would. Then, one morning, a letter had arrived with the first post. It was damp and salt-stained and looked as if it had been fished out of the sea. It had a row of colored foreign stamps on it. Aunt Deliverance opened the envelope with her ivory-and-silver paper knife, unfolded the letter, and read it through twice, in silence, as she ate her breakfast kipper. Then she had fixed Stella with an imperious glare. 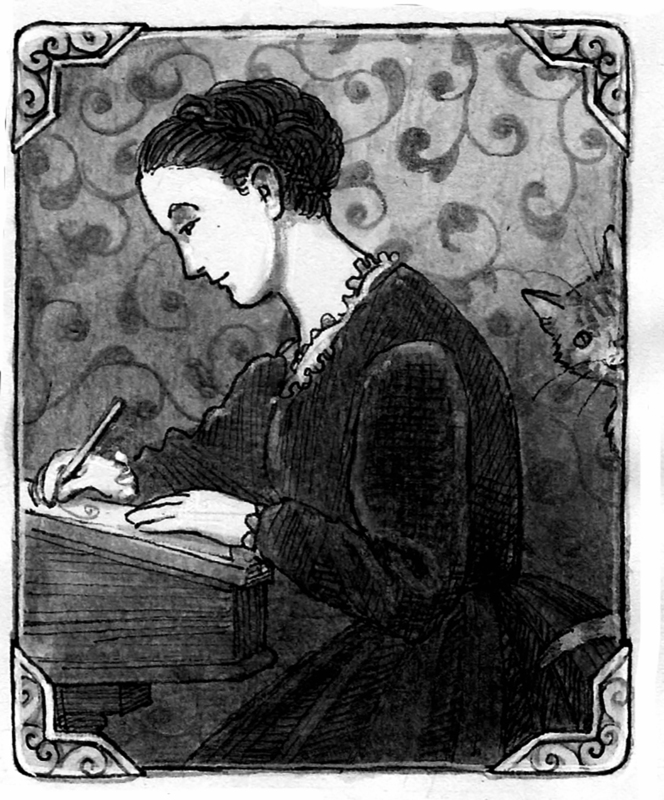 “Curiosity is a sign of a vulgar mind,” said Aunt Temperance. “Yes, indeed,” agreed Aunt Condolence, spreading marmalade onto a triangle of buttered toast. “Yes, Aunt Deliverance,” Stella said, as gratefully and dutifully and obediently as she could manage. Frederick? She was astonished to learn that the Aunts had a cousin. They had never spoken of him. “Frederick’s children, Strideforth and Hortense, have been living abroad. No doubt their manners are foreign and disagreeable. However, a strict governess will correct any faults. They are being prepared for school. You will join them immediately.” Aunt Deliverance glared as she popped a piece of kipper into her mouth and chewed it up in a decisive manner. Stella had stared back at her and bitten her lip to stop the questions from spilling out. She had always lived with the Aunts. First at the Ozone Hotel (where the Aunts had been treated with magnetism and leeches, which had sadly aggravated several of Aunt Deliverance’s many illnesses), then at the Royal George Hotel (where the Aunts had taken cold-air baths and made use of the Influence Machine, which had caused Aunt Condolence’s Particular Patent Corset to hiss and spark in an alarming manner), then at the Hydro Imperial (where the Aunts had eaten a special diet of white food, consisting mainly of lard and tapioca and potato juice, which Aunt Temperance’s insides had found intolerable), and finally at the Hotel Majestic, at Withering-by-Sea (where the Aunts drank the water, took wave baths, and walked briskly along the Front every day). But now the Hotel Majestic was many miles behind her, and every minute Stella was moving farther away from the Aunts and closer to Wormwood Mire and the unknown cousins. “Strideforth and Hortense,” she whispered. They sounded dreadful. The Aunts were dreadful, of course, but at least they were familiar. The cousins would be strangers. In another story from A Garden of Lilies, Euphemia went to stay in a castle. During dinner, she outraged the company by inadvertently using the wrong spoon to eat her giblet soup. Afterward she fell into an oubliette (whatever that was), and she was never seen again. To eat correctly at the table. Stella imagined Strideforth and Hortense and their strict governess as tall, intimidating strangers, sitting at a long table that glittered with knives and forks and spoons and other more complicated cutlery. They all watched her coldly, waiting for her to make a mistake. Her heart sank still further. She knew nothing about her cousins, but she had heard of Wormwood Mire. She had seen pictures of it in Aunt Temperance’s photograph album: an enormous dark house, bristling with towers and chimneys and turrets. She turned the pages of A Garden of Lilies to find the stolen photograph she had tucked in there for safekeeping. She took it out and gazed at it. In the picture, part of a tall house, surrounded by trees, loomed against a cloudy sky. In front of the house, a young woman stood beside two babies in a perambulator. All three stared out of the photograph with startled eyes. Salt water had stained and blotched the picture. On the back was written, in faded sepia ink, P, S & L, Wormwood Mire. Stella stared at the picture and chewed her lip. Her mother’s name had been Patience. She had been the Aunts’ youngest sister and died when Stella was still a baby. Was this a photograph of her? P for Patience, S for Stella. But there were two babies. They looked identical, like twins. Who was L? Had she once had a sister? What had happened to her? The Aunts would never answer her questions. Curiosity is vulgar, silence is golden, Aunt Deliverance always said. Stella looked at the two little faces in the photograph. She did not know much about babies. These looked about one or two years old. Perhaps someone at Wormwood Mire would remember a lady with two babies. Someone who had been there about ten years ago. Ada did not look as if she would answer. Then she said abruptly, “Your Aunts were very good to take you in like they did. That I will say. Very good. Many wouldn’t have, after what happened. If it was me . . .” She stopped and looked at Stella, her lips tight and sour-looking, and she would say nothing more. Stella looked out of the window of the train at the rain. She shivered as she remembered Ada’s words. After what happened. “I’m going to find out,” she promised the three faces in the photograph. “I will.” They stared back at her, wide-eyed. Ever since she had found the photograph in Aunt Temperance’s album, Stella had imagined a sister. Letty was the name she had chosen for her. She pictured her now, sitting here on the train, swinging her legs, cheerful and encouraging. “What if it’s awful?” she whispered. Letty did not answer, but Stella imagined that she shrugged and laughed. Though Letty never said anything very much, she was a great comfort. She was always brave, and she made Stella feel braver too. Stella took one more look at the photograph, then put it carefully back between the pages of the book and slammed it shut. She sat up straighter and gazed out of the window. The train was passing a wood. Trees grew closely together, like a crowd jostling for space. Their bare branches, tangled with ivy, created a jagged pattern against the sky. The raindrops running down the glass made the trees seem to flicker and tremble. The wood looked wild and dark. Anything might live in the shadows. In A Garden of Lilies, on their way to pay a morning call, Florence and Gilbert wandered from the correct path and were eaten up by a hungry tiger that had escaped from a circus. When you are walking through a wood. Of course there were no tigers here. There were no large, dangerous animals at all. Not anymore. The train slowed, with grinding sounds and hissing steam, and drew into a station. It jolted to a stop. “Wormwood Halt,” called a porter. Stella’s insides gave a lurch. Heart thumping, she scrambled up onto the seat to pull her small suitcase down from the overhead rack. She opened it, shoved A Garden of Lilies inside, and snapped the catches shut. She pushed open the carriage door and climbed out. It was nearly dark, and it was raining. "Rewarding, poetic, old-fashioned, warm but never treacly, and packed with dramatic tension, and although major plot points are resolved, there’s still room for another look at this world and Stella’s evolving place within it—fingers crossed."